The Biology Program combines access to modern equipment, newly renovated facilities, and faculty mentors in a program that emphasizes preparing students for careers in the biological and biomedical sciences. The field of biology is about discovery, curiosity, exploration, and the search for solutions that can be delivered by the natural world around us. Biology is a rapidly growing scientific discipline, opening new doors of opportunity and possibility with modern advances in biotechnology and molecular biology. It’s also a field positioned to take on the evolving challenges related to health care in the 21st century, as well as a more proactive mindset when it comes to environmental conservation and sustainability. And it offers an ideal foundation for advanced study in areas like medicine. As a student in the biology program, you’ll embark on a dynamic academic journey designed to prepare you to contribute to the body of scientific knowledge capable of enhancing life for everyone. You’ll have abundant access to newly renovated facilities and state-of-the-art equipment, and will benefit from scientific study within a liberal arts framework—resulting in a well-rounded learning experience. On any given day in the program you may find yourself using molecular techniques to decipher the inner workings of a disease pathogen, or developing mathematical models to solve the mysteries of ecological processes. And you’ll develop the ability to work effectively with scientists and non-scientists on solutions to local, regional, and global problems. the writing and speaking skills needed to communicate effectively in the field. At Carroll, our biology program delivers a number of benefits unique to our location, setting, culture, and educational philosophy. Our diocesan Catholic mission will help broaden your understanding of how and why knowledge in this discipline can serve the needs of others. Our campus, surrounded by the Rocky Mountains and other natural wonders, offers unparalleled learning opportunities in the field. Our students have taken part in research endeavors ranging from molecular biology to ecology, and have taken their studies to locations ranging from the Montana backcountry, to Alaska, to Niger and Ecuador. And our faculty are celebrated experts who routinely earn prestigious grants and conduct groundbreaking research. These are just a few reasons biology leads Carroll in the number of honors graduates and the production of student research projects. As a graduate of the biology program, you’ll we well prepared for any number of educational and career paths ahead. Potential fields for alums of the program include animal behavior, bioinformatics, biophysics, biotechnology, botany, ecology, forensic science, genetics, horticulture, microbiology, physiology, and zoology, among many others. And many graduates pursue advanced degrees in medicine, dentistry, and veterinary medicine. In fact, over the past 10 years, 89 of our graduates have entered medical school, 30 have entered graduate programs, 26 have entered dental school, and 42 have been accepted into professional programs like veterinary medicine, physical therapy, optometry, and pharmacy. Dr. Stefanie Otto-Hitt has received a two-year life sciences award in the amount of $42,088 to continue her study titled "Molecular Control of Synaptic Function." This is the second two-year grant Dr. Otto-Hitt has received from the M.J. Murdock Charitable Trust. The molecular neuroscience research examines how proteins in the brain affect the strength of communication between brain cells. Check out this Helena Independent Record article about biology graduate Galen Mills, who served in Guatemala after graduation. Mills is now in medical school at the University of Washington School of Medicine. Can students pursue a biology major and participate in athletics? Biology major Leah Esposito '17 graduated with a 3.97 GPA while closing her standout career as a student athlete on the track and field team. She recently became the second person ever to repeat as the Overall CoSIDA Academic All-America of the year. Congratulations to the Biology class of 2016! As a cohort, they scored in the 97th percentile on the ETS Major Field Test. The test is administered at about 510 colleges and universities across the country. 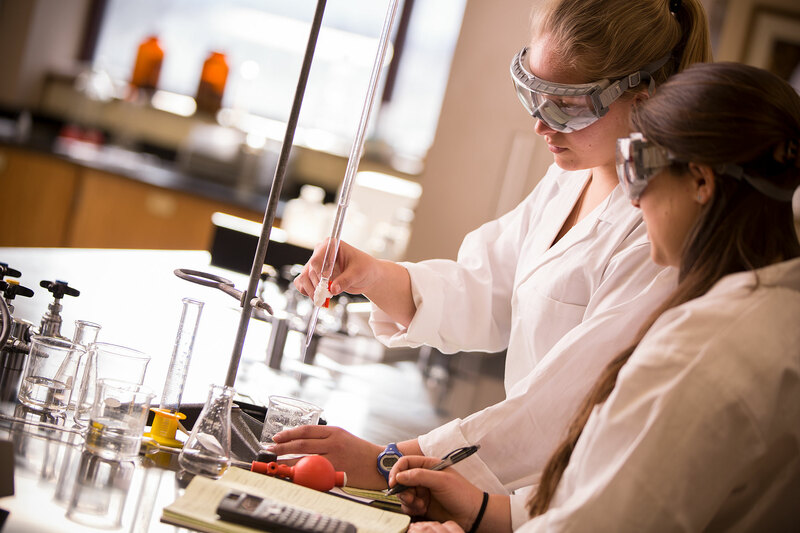 Carroll College biology seniors have scored in the 90th percentile or above since we started administering the exam 20 years ago.